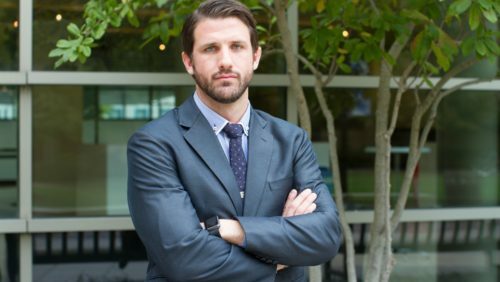 The story of Derrick Anderson (L’19), a former Green Beret pictured at Georgetown Law, was featured on “60 Minutes” in November. While serving in the military, he watched as five U.S. soldiers were killed in a friendly fire incident. Former Green Beret Derrick Anderson (L’19) knows the courage and the sacrifice of those in the military. While serving in the U.S. Army in Afghanistan at dusk on the evening of June 9, 2014 — trying to protect a polling location from interference during the Afghan elections — his Special Forces A-Team was fired upon by the Taliban. Anderson and his team called for air support from the U.S. Air Force. They asked the pilots whether they were able to see their lights on the ground. The pilots confirmed that they could. So what happened next was unexpected — and horrifying. “They [inadvertently] dropped two five-hundred pound bombs on my guys, killing five U.S. soldiers and one Afghan soldier,” said Anderson, whose story appeared on “60 Minutes” on November 12. An Air Force investigation concluded that Anderson, as the commander on the ground, was partially to blame. But a scope on the airplane was unable to detect the lights, he says, and the pilots thought that it could. Anderson set out to clear his name. In this mission, he had the help of one current JAG attorney, one former Green Beret JAG, and a civilian attorney. One of the JAGs was Georgetown LL.M. alum and former Major General Tim Haake (LL.M.’77). The experience, as harrowing as it was, would ultimately send Anderson to law school at Georgetown Law less than two years later. Anderson grew up in Virginia and went to Virginia Tech on an Army ROTC scholarship, the first person in his family to go to college. After graduating in 2006, he set out to fulfill his four-year commitment to the Army. He went in as an infantry officer and ended up going to Ranger School in Fort Benning, Georgia — a two-month course that teaches tactics in high-stress situations. By May 2007, he was a platoon leader in Iraq, in the 3rd Infantry Division. Iraq was a rough deployment — 7 people in his company killed — so when he returned to the States, he applied to be an Honor Guard, one of those who serve in Arlington National Cemetery. Anderson would serve through more than 140 funerals, escorting Senator Ted Kennedy’s coffin to the grave site in 2009. Training was physically and mentally tough. He learned Arabic. He learned how to evade capture and resist interrogations. And he got his Green Beret. He took over a Special Forces A-Team and deployed to the Middle East, and was later added to a prestigious dive team, like SEALs in the Navy. He went to Jordan and Bahrain. And then came his life-changing mission in Afghanistan, in 2014. With the help of his attorneys, Anderson was cleared, facing no military or disciplinary action for the events of June 9, 2014. But he left the military, ready for law school. He took the LSAT in Beirut, Lebanon — and did a final deployment to Israel. He kept in contact with the families of those killed; the mother of one would write a recommendation letter to Georgetown Law.